Groupe Bellene is composed of the wine trading company “Maison Roche de Bellene” and the winery “Domaine de Bellene”. Their companies are both located in Beaune. Domaine de Bellene was founded in 2005 by Nicolas Potel after the purchase of various old vines in some of the best plots of Burgundy. This winery was created with a desire to control the entire production process, from the soil cultivation to the wine sales. They produce their wines following organic farming methods and they have always sought to cultivate their vines in the respect of the soil. They aim to yield very healthy grapes of the highest quality in terms of phenology and they want their wines to express the terroir from which they come. Here at the Domaine de Bellene, they truly act on environmental, nature and terroir preservation. Maison Roche de Bellene wine trading company offers a complete range of wines. They select and age their wines with the greatest care, preserving the unique terroir of Burgundy. The wine is racked depending on the lunar and the biodynamic calendars. Then the wine is aged in very old cellars in order to benefit from the best ageing conditions. Their wine trading company operates in 54 countries through a wide distribution channel, dealing with more than sixty appellations from several climates and vintages. Today, Maison Roche de Bellene is famous all over the world thanks to renowned journalists, wine tasting notes and reviews. Thus, our wines are sold in the most prestigious places and in the largest cities in the world. In 1964 Françoise and Gérard Potel arrived in Burgundy in the village of Volnay. The Potel’s started producing high-quality Burgundy wines at the winery “Domaine de la Pousse d’Or”. In the beginning, the family estate stretched from the villages of Volnay and Pommard to Santenay. This estate quickly developed and became a renowned winery in Burgundy. Before taking over the family run business, Nicolas Potel benefited from enriching experiences all over the world. He had the opportunity to learn from the most prestigious winemakers and to get a new approach of the vineyard work (Margaret River winery, Matrot winery, Georges ROUMIER winery, Yarra Valley winery, DEHLINGER winery, Leeuwin Estate). Once back in France, he worked as a vineyard manager and developed organic agriculture at the family estate. After his first steps as winemaker in the family Estate “le Domaine de la Pousse d’Or”, he built up his own negoce in 1996 then, in 2000, Maison Potel-Aviron in Beaujolais region. In 2005, Nicolas built up his own Estate, Domaine de Bellene, in Beaune with 24 Ha of vines cultivated following the organic method. In 2008, after the departure from SAS Nicolas Potel company, Nicolas Potel launches his new negociant business called "Maison Roche de Bellene". He decided to focus on offering the finest wines, in limited cuvées in order to be the only "Haute Couture" negociant in Burgundy. Nicolas Potel has also launched a range of very rare older vintages, under the name "Collection Bellenum". These wines, dating back to 1959 to 2007 are the result of a very strict selection of old vintages exceptionally released from the wine cellars of some of the most famous producers of Burgundy. Domaine de Bellene / Roche de Bellene is based in the motherland of "Cool Chardonnay", in the heart of Burgundy and in the city centre of Beaune. Burgundy needs no justification of Cool Climate Viticulture. 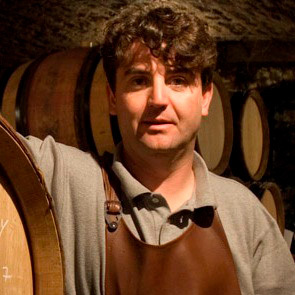 Nicolas Potel, the owner/winemaker is known locally and around the world for his passion, knowledge, dedication to the wines of Burgundy. Winemaking aside, it's Nicolas' infectious Joie de Vie and love of culture, gastronomy, humanity and ultimately "the art of celebration." The old-school philosophy in the vineyard and cellar are the epitome of "Cool". All the vines are grown with the biodynamic methods with old vines, mostly 50 to 110 years old. In the cellar with Nicolas and his team, the wines are made with minimal intervention in a natural way adding rarely any outside products to the wines; no acid, no cultured yeast, nutrients, enzymes, sugar. If you get a chance to meet Nicolas Potel over the weekend and try his wines, you will understand exactly what it means to be "Cool".